Get creative this Thanksgiving. With an assortment of hues to captivate your guests, potted poinsettias can be the star of your holiday tablescape. Most famous for their festive, velvety red “blooms” called bracts, poinsettias come in a variety of colors, including white, pink, salmon and orange. Many bracts even display marbled bicolor combinations. This Thanksgiving, incorporate potted poinsettias into your table décor to create a stunning fresh centerpiece with charming accents. 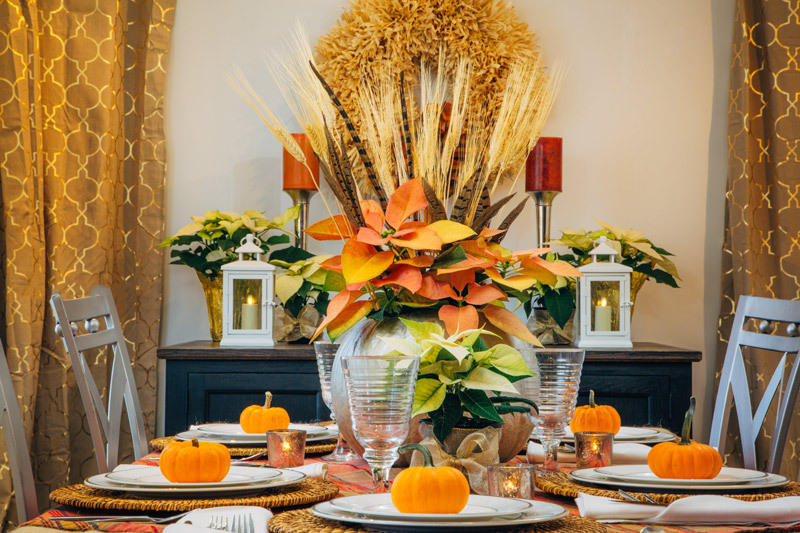 For this rustic centerpiece, we set a 5-inch potted poinsettia inside a carved pumpkin. Try painting your pumpkin a soft neutral metallic or off-white for a more polished look. We placed pheasant feathers and dried wheat stalks in the poinsettia to give the centerpiece more height and texture. Keep this centerpiece classic with a white poinsettia or add a pop of color with a unique bi-color shade. Smaller potted poinsettias as accents give you another opportunity to bring in more color. When selecting potted poinsettias for accent pieces, alternate plant heights to prevent your table décor from becoming too bulky or overwhelming. We used 4.5-inch potted poinsettias. 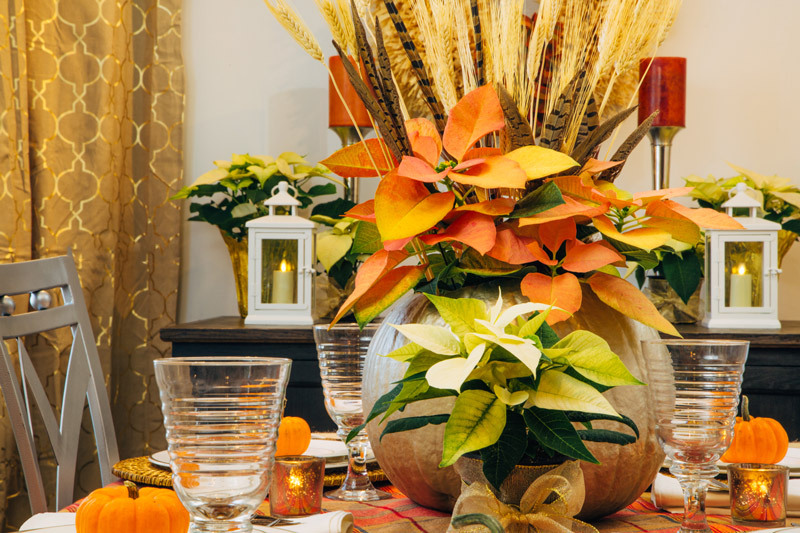 Pumpkins and gourds are the perfect complement to a potted poinsettia centerpiece. 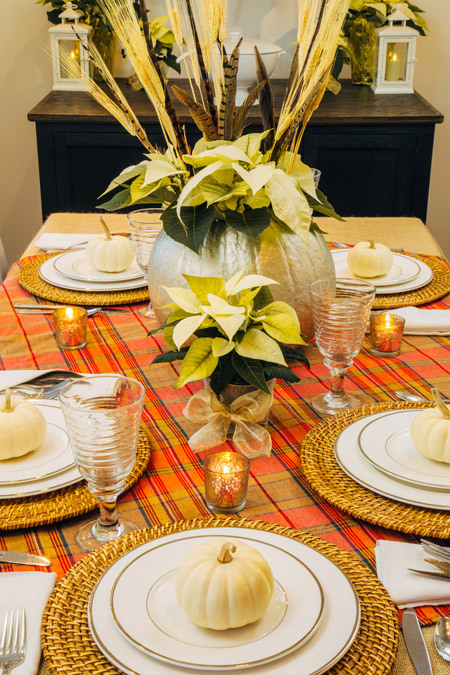 We completed the fresh, rustic aesthetic with small pumpkins at each place setting. 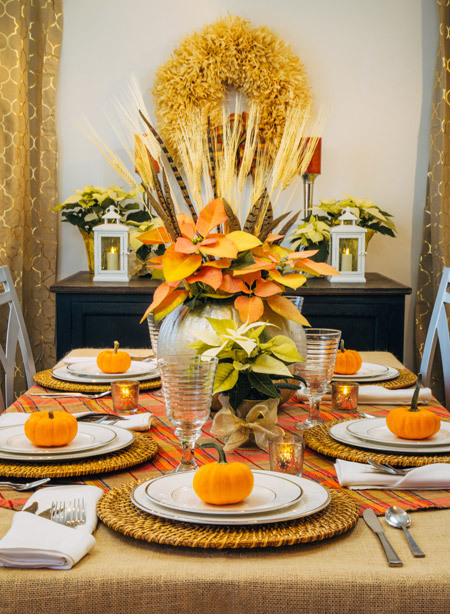 Experiment with different colors, shapes and placement of pumpkins and gourds to find a look you love. 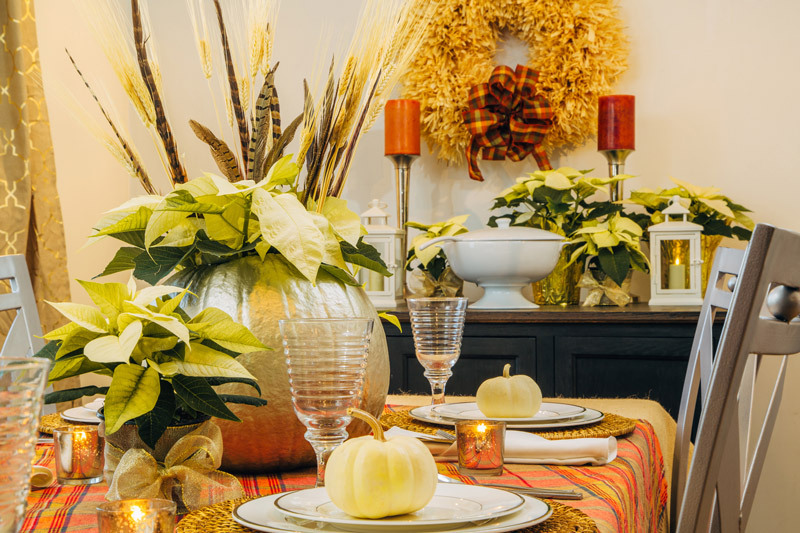 With the right color palette and accents, potted poinsettias can transform your Thanksgiving tablescape into an original work of art. Proudly continuing to innovate and adopt new technologies so that future generations can always enjoy our beautifully grown plants.